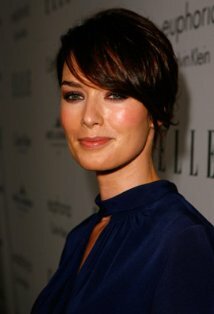 Lena Headey is a British actress who is best known for her appearances in The Brothers Grimm (2005), Possession (2002), and The Remains of the Day (1993). Headey stars as Queen Gorgo, a heroic Spartan woman in the period film 300 (2006), by director Zack Snyder.She was born in Bermuda, where her father, a Yorkshire police cadet, was sent shortly before she was born. She was raised in Bermuda living on the ocean, until she was 5. Back in England, she was brought up in Yorkshire, before moving to London in her teens. Headey had not gone to drama school before she became an actress. At the age of 17, Headey's performance in a one-off show in the company of six school friends caught the attention of a casting agent, who took a photo and asked her to audition. Eventually, Headey was cast in Waterland (1992), which became her big-screen debut. She honed her natural acting talent while filming and also took archery classes and horse training. She also took boxing classes in clubs in south London, where a former boxer had been teaching her to spar. During her film career, spanning over 15 years, Headey has showed her range in a variety of roles, playing characters from Amazon-type warriors and action-minded women in The Cave (2005) and The Brothers Grimm (2005), to a lesbian florist in Imagine Me & You (2005).Headey's film career took her all over the world. She was in India for the filming of The Jungle Book (1994), then in St. Petersburg, Russia, for filming Onegin (1999), and in Norway for filming of Aberdeen (2000). In 2005 Headey was filming in Romania and in Mexico, then spent four months in Prague, Czech Republic, where a forest was designed and built for filming The Brothers Grimm (2005), with Matt Damon and Heath Ledger. During 2006 Headey was in Canada for the filming of 300 (2006), then went to locations in Bulgaria for shooting The Contractor (2007) (V), and Germany and in Czech Republic for the filming of The Red Baron (2008).She also plays Gina McVey in the horror thriller The Broken (2008), and Elizabeth in Tell Tale (2009). In addition to her film-work, Heady appeared as Sarah Connor in a TV spin-off of the popular "Terminator" film franchise, the FOX's television series "Terminator: The Sarah Connor Chronicles" (2008).Outside of her acting profession, Headey continued taking boxing lessons in London. She is a vegetarian, and also remains loyal to yoga, which she discovered during her work in India. She has never been back to her birthplace in Bermuda, and shares her time between her homes in London, England, and Los Angeles, California.